Every one of us has gazed up with an open jaw when we first saw an aeroplane in the sky and wondered how it flies. We, at Aero VJTI, are the ones who actually went a step further and took it up as our probable vocation. We come from one of the oldest and most reputed engineering colleges 'Veermata Jijabai Technological Institute (VJTI), Mumbai'. We design and fabricate RC aeroplanes to participate in competitions worldwide. 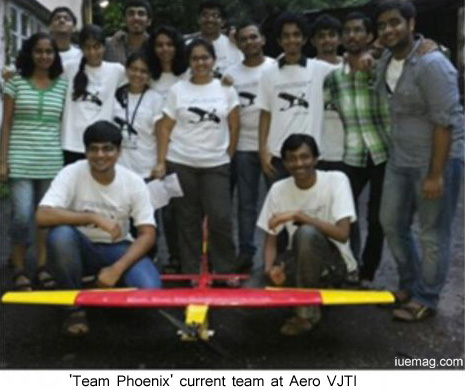 Aero VJTI participated in SAE Aero Design West 2011 in the regular class and stood 21st internationally with the design report ranking 5th in the world!! In 2012, our team was Asia's first team to participate in the advanced class of SAE Aero Design West and stood 6th internationally with their oral presentation ranked 1st worldwide!! Our aim remains to better our performance with each passing year and making India proud. To put up the best we can, to compete in the AIAA DBF Competition held at Wichita, Kansas, we are designing according to the rigorous constraints and putting our model through a series of tests and optimizations. The competition aims at making sure that along with being adept at designing the aircraft, the team also has the ability to manage time, distribute workload and to put team communication to test. We bring the same experience of seeing one's own creation soar up in the sky to our juniors in colleges across the city by conducting workshops. A hundred eager students in each of our workshops worked on weekends to learn aerodynamics and to build their own RC aeroplanes. The kind of response we received in our workshops gives a clear indication of the interest the country has in this less ventured sector of aeronautics. Our basic objective is to promote this and bring this hobby of a few within the reach of everyone interested. We have worked together with an NGO towards imparting better education to school kids from struggling families and orphanages by teaching them the basics of science and answering their question of how do aeroplanes actually fly. Also they were taught to make small chuck gliders out of a more durable plastic material. The smiles on their faces definitely give us an assurance that this exposure to aerodynamics might someday be of help to them. The aircraft is ready, seatbelts are tightened, for India's flight to glory! Please help us take off this April for our competition. All kind of support is welcome! Our efforts are dependent on your support to bear any fruit! Any facts, figures or references stated here are made by the author & don't reflect the endorsement of iU at all times unless otherwise drafted by official staff at iU. This article was first published here on 3rd February 2014.